I just wanted to learn the song and rehearse on my slide guitar so I haven’t added much in this mix, and the slide was out of tune towards the end (more like I just wasn’t hitting the right notes. The overdrive tone, also, was not intentional…I plan on using a nice clean thick tone with a volume pedal, on the final version). I’ll post some pictures of my recording setup for the slide, later, but what I’m using is a 1950’s Fender lap steel, played with fingerstyle picking and a 3 x 1 inch bar of steel between the fingers. In this version I’ve just turned on two ribbon mics, one about ten feet away in the other room, the other closer to the amp but not even positioned properly (4 feet above the amp). I really just turned on the amp to play, and decided to turn on the mics, where they were, then eq’d the track quite a bit with a low rolloff from about 150hz down, to cut out rumble from an air conditioner and extra bass frequencies, and high rolloff to defeat some of the hiss from the mics being turned up so loud and so far away from a fairly small, quiet guitar amp. I panned the two mics out left and right, and then in the mix, I turned the far mic up and the closer mic down until they were fairly balanced, left and right. Once I get the chords figured out better, I plan to follow them more especially in certain places, but for now, just some experimentation. You might not be able to tell, but I also recorded a third part harmony in the chorus and a bit of extra harmony towards the end, just to hear how it would sound. Not sure where we’ll go with this song, especially with drums (if any), but wherever it leads, this little tune is probably my favorite track on the album right now. I plan on going through all of the songs over the next month and I’ll probably record some demo tracks along with the others also, especially Des’s songs. 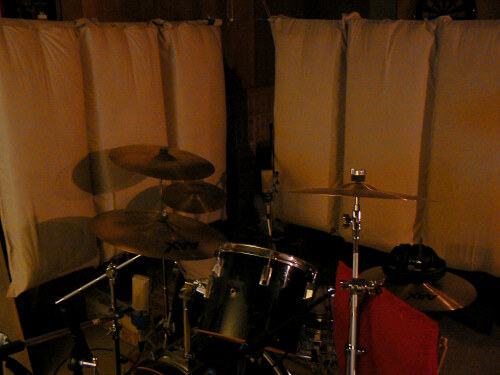 Des re-recorded drums, this time waiting until the second chorus to bring the drums in. At first, I wanted to hear more drums, drums in the first chorus; but realizing that we’ll be adding more instruments and re-recording the vocal and guitar, I think that leaving the drums out in the first verses and chorus — waiting until the second chorus for drums — will leave the song open for varying the dynamics of the song. Perhaps a hope to bring in each instrument slowly, in specific parts of the verses, choruses, to illustrate a dynamic song which has various stages of evolution. I put together some drum ideas to go with this new version. It wasn’t meant to be a final drum take. Rather, I hoped to get Rich’s thoughts on which bits he liked and disliked. Personally, I’m not sure Method Of Delivery even needs drums. 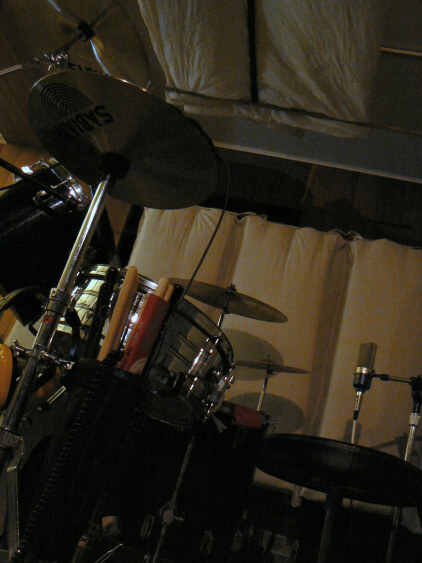 But if we add a drum track, it will be much less prominent than most of what I recorded here. The drums definitely shouldn’t come in right at the start of the song. And Rich feels there should be more to the interplay between the hi hat and cross stick in the quiet parts. - The big, slow crashes at the end of each section. Here’s a demo of Nothing Up My Sleeve, written by Des. The lyrics are on the lyrics page. It’s an older song, but I just now got around to recording it. I have this nasty cold, and certain notes are off-limits, so I dropped the key of the song to F. It should be in G.
- 2 Apex205’s as overheads (marked in the picture below with green arrows.) This is the “recorderman” part of the setup. The other 4 mics just augment the OH signal. - An Apex 210 on the kick drum, about 2 feet in front. - 2 Studio Projects C4’s as stereo room mics, about 15 feet in front of the kit, up high. The overheads clearly aren’t “over head.” I have them on the same plane as the toms where they pick up a better balance of the toms and cymbals. The new baffles around my drum kit completely changed the way my room sounds. So even though I’ve mic’d the drum kit dozens of times, we decided it made sense to start from scratch and get the right sound. Here’s a short mix I sent to Rich for feedback. (The song is Don’t Think I Don’t Miss You, and it’s the same bass, guitar, and vocals as the original, with a new drum track.) I was happy with it at the time, but as so often happens when I listened to the mix a few hours later, I realized it wasn’t as good as I’d hoped. 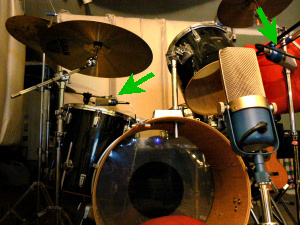 The snare drum is a little smeared in the stereo image, and the cymbals lack focus. We’re recording a no-messing-around rock album. We don’t expect to have a lot of sonic experimentation, or production trickery in the final tracks. So once we get the drum sound we want, I can probably use the same mic setup for every track. It’s worth it to put the time in now and get it right! We (i.e. Sarah :-)) sewed doubled-over sheets into pockets which I then filled with Roxul Safe’n'Sound. I hung the baffles from ceiling hooks drilled into the joists. Really cheap, and really effective. And since they’re hung from fixed hooks, I don’t have to worry about them moving and changing my room’s response. Rich and I agree on the importance of a consistent sound from track to track on this album. We don’t want to record a collection of singles. Rather, the album should sound coherent, as though recorded like a traditional album: In a series of sessions, in the same studio, by the same musicians. We expect this will be a challenge for two guys recording 500 miles apart, over 6 months. More than any other instrument, and especially in full-band arrangements, the drum tracks define the acoustic “space” in which a song sits. 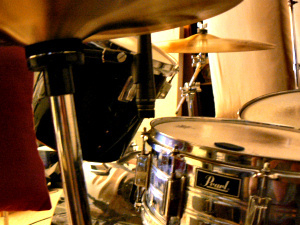 A small, constricted drum sound can make a mix sound lifeless, regardless of how much energy there is in the performance. Alternately a big live drum sound can pull the rest of the instruments out into the open. Further, although Rich and I are used to recording our instrument parts to a click track, music usually sounds more organic when the band follows the natural push and pull of the rhythm section. We want that organic sound! I’ll be recording all the drum tracks for the album, so at this point, it falls on me to get miking and nail those drum tones! Here’s the original demo of Whether or Not, written by Rich. You can also read the lyrics. Here’s the original demo of Won’t Be Long, written by Des. You can also read the lyrics.